Customers buy more from machines than human workers. Self-serve kiosks: Great for McDonald’s bottom line, potentially terrible for your waistline. If you haven’t walked into a fast food restaurant lately, well, congrats on your willpower. But when you do finally succumb to those greasy sirens, you could be in for a shock. In addition to their cashiers, many of the restaurants now boast self-serve kiosks, touchscreen stations where you can tap in your order like you’re using a (very fun) ATM. Great. Another industry turning to automation so it can avoid paying human workers. right? Not so, claims McDonald’s — workers will just shift to different roles, such as delivering food directly to customers’ tables. The real financial benefit? Apparently people buy more from kiosks than they do from cashiers. 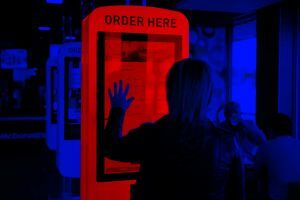 “There’s a little bit of an average check boost,” McDonald’s Chief Executive Steve Easterbrook told CNBC on Monday, just before announcing the company’s plans to add kiosks to 1,000 restaurants per quarter in the U.S. over the next two years. According to Big Think, the kiosks could increase sales as 5 to 6 percent in the first year they’re available. What is it about standing in front of a screen and not a judgmental human face that makes people want to order more food? A couple of things. Apparently, the longer you have to consider your options, the more likely you are to discover foods you want to order. There’s also something about using a touchscreen that’s just, well, kind of fun. According to a 2017 study that compared sales made via a touchscreen with those made via a desktop computer: “When a consumer uses a touchscreen device, the novelty and fun generated by finger movements create experiential and affective feelings, in alignment with the playfulness and emotional nature of hedonic products.” (Hedonic items are products we don’t need, but that give us feelings of joy or pleasure). So, if you don’t want to rise to new caloric heights and impulsively add a McFlurry or apple pie to your lunch order, you might want to skip the very fun kiosk and head to real-life cashier.